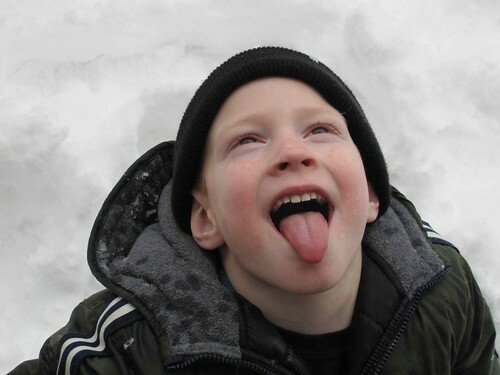 This was going to be the potd, Kade catching drips from icicles, until I went to do a load of laundry and found this. Can you guess what the kids did this afternoon? If you guessed play outside you'd be correct. The second picture better represents our normal life. Not that the first doesn't. 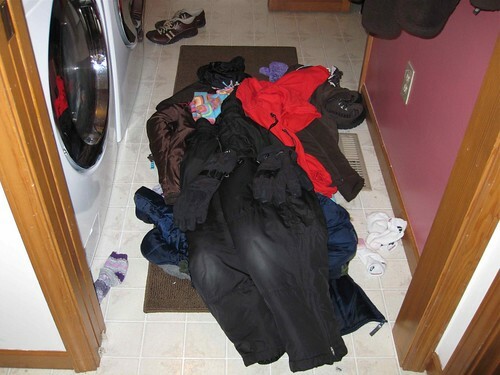 The second (clothes laying on the floor in a pile) is much more likely to happen, on a daily basis. Other things we did today. We all cleaned the church for the last time. Then Mickey took Meg and Kade to sign up for little league. We have now committed ourselves to months of practices and ball games. Then they stopped by Home Depot for a few project supplies, then Best Buy, and lunch. Meanwhile, Mattey and I went to JoAnn for a few things and stopped at the mall to find some earrings. We found some great deals. We ended up having lunch in the food court. Now Mickey and I are going to enjoy some quiet time while I now do two loads of laundry.